It’s been fifty-six days since an explosion shook the Deepwater Horizon oil rig operated by British Petroleum Plc, better known to most simply as BP. Fifty-six days since oil has been gushing out of the earth in volumes even the “experts” grossly underestimated and still, with volumes approximated at as much as 19,000 barrels of crude oil leaking out of the well per day just over two weeks ago, actual volumes are still unknown and, in fact, even more recent claims have been that upwards of 40,000 barrels per day have been leaking into the Gulf. To give a better sense of just how much oil is leaking into the sea, one barrel of crude equals 42 gallons. This means, using the 40,000 barrel figure, that just around 1.7 million gallons of oil, per day, are contaminating the entire Gulf of Mexico, over 94 million gallons total so far (using these figures). Most people view oil as the source of gasoline in their vehicles and each barrel of crude oil yields about 18.6 gallons of gasoline, which means the volume of crude oil leaking per day is enough to refine into over 740,000 gallons of gasoline. This is enough to power a gas-guzzling sport utility vehicle for over 675 years. Let me repeat that: In one day, the amount of crude oil leaking into the Gulf of Mexico can produce enough gasoline to run your car for well over 675 years! 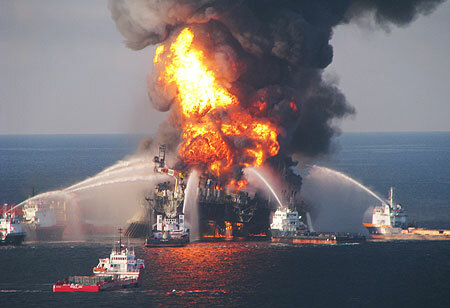 BP's Deepwater Horizon offshore oil rig exploded on April 20, 2010, killing 11 men and resulting in a damaged well that has, to date, leaked over an estimated 900 million gallons of oil into the Gulf of Mexico. It has been known for quite some time that large amounts of oil and natural gas exists beneath the sea floor in the Gulf of Mexico. To the everyday consumer, since the events of the past couple months, it may be even more obvious that the reservoirs there are far more massive than they previously realized. Now is where the geology comes in. The petroleum industry employs geologists because they know the geologist understands how oil is formed and, therefore, where to look for it and how best to recover it from the earth. How did it all get there? Oil is simply the bodies of ancient plants and animals. Many people think of dinosaurs as the main contributors to oil and gas deposits. This is not so. In fact, the creatures responsible for oil and natural gas lived even before the dinosaurs, from the Devonian and Carboniferous Periods and into the Tertiary (oil in the Gulf of Mexico is primarily found in the latter), and in the oceans! These plants and animals were primarily very tiny, like plankton, and when they died their remains fell to the sea floor into anoxic (zero-oxygen) waters. Here, their bodies were buried by sand and fine silt sediments. Over time, dead plant and animal remains piled up and were buried under more and more sediments. After millions of years, the immense pressures and rising temperatures (greater depth in the ground will result in both), broke them down into oil and gas. This process also results in the lithification of sediments, a process in which the sediments compact under pressure to become rock (like sandstone and shale). While it’s hard to comprehend the amount of pressure this takes, you can think of it as laying on your back with a large rock on your chest. Now, have someone stack more rocks on top until there is a pile about 2-4 miles high on top of you. This is the typical depth below the sea floor in which many oil reserves exist in the Gulf of Mexico. These resources do not exist as a whole body of fluid in a large cavity in the ground, as the term ‘reservoir’ may suggest. They are found within the pore spaces of the rock itself, filling the small gaps between individual sand and silt grains. A rock with a large amount of pore spaces is said to have a high porosity. When those pore spaces are interconnected, allowing fluid to easily move between them, the rock is said to be permeable. Therefore, in the best conditions, oil and gas would be found in a highly porous, highly permeable rock. However, in most cases, these conditions are not always there. Yes, in order for a significant amount of oil to exist, the rock must be highly porous. But if not very permeable, the oil and gas will not flow to an oil rig’s recovery well very easily. This calls for a process called hydraulic fracturing, or simply “hydrofracking.” This petroleum engineering technique, utilized for over half a century, is a way of inducing porosity in an oil-containing rock formation by means of fracturing it. These fractures, referred to as secondary porosity, are created by increasing internal fluid pressure in the borehole (the hole drilled in which a recovery well will later be installed). These fractures effectively connect pore spaces in the formation and serve as conduits for fluid natural resources to flow to the recovery well where they are extracted. The term “fluid natural resources” was used here for a reason. Hydrofracking is most commonly associated with petroleum recovery, yet it is not exclusive to this resource. Natural gas wells and even groundwater recovery wells, used as a source of clean drinking water by many municipalities, states, and countries around the world, use this process as well to increase the rate of recovery. Coming back from my tangent lesson in geology, you may take away from all this that there appears to be an unlimited supply of oil and gas buried in these Tertiary-aged rocks, but there’s a reason they call these resources non-renewable. While they may sustain us into the foreseeable future, sooner or later these reservoirs will be tapped out. What’s worse, the process of creating more oil, gas, and even coal (created from a similar process) takes tens to hundreds of million of years…slightly longer than we can wait if we were to run out. This is why companies limit their supplies and why BP is trying to recover oil off the surface of the Gulf of Mexico not only to save the environment, but to save profits that would otherwise be lost forever. This is as far as I will go on the political reasons for stopping the leak, but let’s talk about what’s being done to keep problems from getting worse. 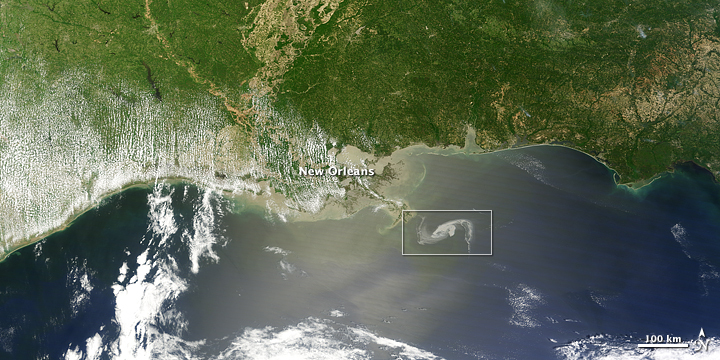 View of the Deepwater Horizon oil slick in the Gulf of Mexico from space. Photo taken April 29, 2010, courtesy of NASA Earth Observatory. BP has tried several methods of stopping the oil leak occurring a mile beneath the surface of the Gulf of Mexico. Yet, so far, not much has worked. The “top hat” attempt, in which a three-story steel box was lowered over top of the leaking well head failed due to ice build-up causing the box to become too buoyant to sit firmly on the sea floor, which was required to create a seal so that oil would not escape. Other methods, such as plugging the well and siphoning the oil through a second tube have also been met with zero result. Only yesterday, BP began the process of installing sensors at the wellhead to provide the first real data which will allow scientists to analyze the leak and give reasonable answers for the volume of oil leaking rather than educated guesses. Currently, BP has had some success by cutting the kinked well riser and covering it with a well cap that is capturing some oil, about 630,000 gallons a day. Plans are in the works to begin a siphoning effort which will capture up to 400,000 more. But with 1.7 million gallons a day leaking, potentially more, these efforts are still allowing well over 600,000 gallons of oil to escape every day. Drilling of two relief wells, which began twelve days after the rig exploded in April, is expected to be completed in August. These will serve to reduce pressures on, and redirect oil from, the leaking well. So far, this is the best hope to put an end to the millions of gallons of oil leaking into the Gulf each day. Now remember that this has been going on for almost 60 days with only minimal success in slowing the leak and we still do not have a definitive answer for the exact volume of oil that is creating an oil slick so large that it can be seen from space. In some ways, this could be considered the largest man-made feature ever created. Mick Jagger may not have had a thick coating of black and brown oil in mind when he sang about painting his red door in the 60’s, but I can’t help but feel that, had the song come out today, it may have had a whole new context. In my opinion, the dispersant being used on the oil in the Gulf of Mexico won’t do much besides make the water appear cleaner, with a stress on the word “appear”. The dispersant is a chemical itself, one which many say is even more damaging to the environment than the oil and will remain in the waters and sediments of the Gulf for quite a bit longer. Additionally, it is not a method of oil recovery, which means that, although it may be breaking the oil down, it isn’t removing anything from the system. Now, this is only my opinion, and I have not done much research on the benefits and effects of dispersant use, but I feel that there won’t be many (if any) good to come out of it other than public reaction: if they can’t see the oil, than it must be getting better. This, in actuality, is quite the opposite. The chemicals used in the dispersant will eventually be ingested by aquatic life and the concentrations in their body tissues will increase through the process of bio-accumulation. If this happens in food supplies, as it undoubtedly will, these chemicals could make their way onto our dinner plates. Are you familiar with bioremediation oil dispersants? I researched them right after the spill & found quite a bit of info. Some could be boiled for ten minutes & not be destroyed, frozen & not be destroyed, completely dehydrated for three years with no nutrition & still be viable. Most were manufactured in China, Saudi Arabia, Iran. I tried to find the same websites recently & had difficulty locating the same info. Living microbes that ingest the oil on one end and are hydrophylic on the other(This is why they sink) can have a gene that expires the organism. I can’t get an answer to how many different organisms have been used & if they have an expiration. New organisms created in a lab living unchecked in the Gulf with no expiration check is not good.Can anyone find out for sure what was used? Do you have any opinions, information, predictions about the dispersants used? There are two reasons the website you cited has a much smaller total value of 68.7 million gallons. First, it is based on an estimate of 30,000 barrels of oil a day, rather than the 40,000 barrel/day estimate I used from a different source. Second, I mistakenly added a zero to the end of my total estimate, which should have been 94 million (rather than 940 million). These numbers are still only estimations of what is actually leaking. The sensors BP has installed should give us a much greater idea of what has actually been escaping since the leak began almost two months ago. It is likely that neither of these cases are going to be very accurate. Thanks for the catch, Enrique!